Dr. Fredricks takes us on an amazing journey through time and through various cultures and religions, with the topic of fasting serving as the common thread. She carefully and masterfully documents facts about fasting that are truly fascinating! Her research on the effects that fasting has on depression is simply astounding. This book is such a treasure. I will cherish this book forever as it is a virtual encyclopedia of information on the subject of fasting. I have literally read every book on fasting from Herbert Shelton to Joel Fuhrman and I have never seen a book on fasting that is as well- referenced as this book. I would highly recommend it to anyone interested in the subject of fasting. 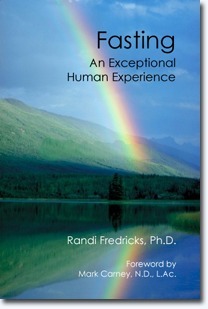 Fasting: An Exceptional Human Experience is a very ambitious book. The breadth of the topics that pertain to fasting are astonishing. Dr. Fredricks puts forth a number of theories with regards to the psychological effects of fasting that are revolutionary. Her theory of psycho-spiritual autophagy and how fasting facilitates it are truly groundbreaking. I had previously read fasting books written by Herbert Shelton, Joel Fuhrman, and others (which were decent but boring), but until I read Fasting: An Exceptional Human Experience, I had no idea that a book about fasting could be so interesting. There is a chapter on Hunger Striking and another on Eating Disorders that in and of themselves make the book worthwhile. Dr. Fredricks certainly opened up my eyes as to how vast the topic of fasting is. You would have a hard time finding someone in a better position to write this book. Dr. Fredricks is a psychotherapist who specializes in alternative medicine and she heads some of the most important studies on how fasting affects mental health. In Fasting: An Exceptional Human Experience, you will learn what the latest research shows about how fasting can help you avoid and prevent various diseases and disorders. The book also explains how to read the latest news on fasting and interpret the studies they are based on in the future. The book contains a lot of helpful information about how to plan a fast and things to watch out for. I was particularly impressed with the summaries of the data in the chapters on fasting and mental health. For me, the best chapters are the ones about transpersonal psychology and depression. The research Dr. Fredricks has done on fasting and depression is phenomenal. This is an excellent and life-changing book. ~ Hunter J. Fasting on juice for 30 days cured me of many illness in my youth and helped me develop a unique path though life. Fasting is transformational. This book covers fasting in that is changes our viewpoint of ourselves and our place in this universe. I recommend it. My first experience with water-only fasting was in 1991. However, it was not until the mid-90’s after connecting to the internet that I have been able to easily research various alternative health treatments, while still managing normal non-health related businesses. Fasting, followed by good nutrition and exercise, has proved to be much better for me than any allopathic pharmaceutical intervention. It is now a subject I have decided to study more intensively as a mature-age student in a Master of Wellness Degree. It is knowledge that will serve me well for the rest of my life. Water-only fasting has taken a back-seat role compared with juicing over the last 50-60 years. Recent clinical research, however, is now showing that water-only fasting is superior to many other interventions for treating a range of diseases. Dr Randi Fredrick’s has extensively researched the literature on water-only fasting, and her book is an excellent reference for anyone interested in studying the subject or even to undertake fasting themselves. It will remain a good reference book for many years to come.